Animal Trust Ellesmere Port is a caring, friendly surgery that operates from a large, well equipped facility just off the M53. The surgery has 2 operating theatres, fully air conditioned inpatient and outpatient facilities with separate dog and cat wards, in-house laboratory for rapid diagnosis and ultrasound and X-ray imaging suites. The surgery has a large free private car park and is adjacent to Ellesmere Port Train Station. Animal Trust Ellesmere Port sees patients from access the Wirral, Merseyside, Cheshire and North Wales. The surgery provides the full range of day to day veterinary services such as vaccinations, medications and neutering, in addition to the more advanced treatments sometimes required including TTA repair for cruciate rupture or complex ear surgery. 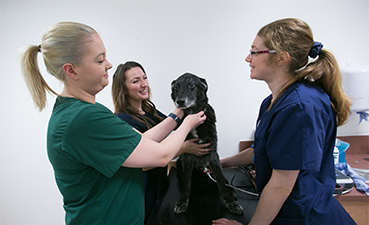 The team of qualified vets and nurses at Animal Trust Ellesmere Port regularly receive compliments and great reviews from their customers for their levels of caring and expertise. The team are always happy to provide advice for pets with no consultation fee required. A large number of pet owners have moved their veterinary care to Animal Trust Ellesmere Port, and in addition to providing a warm welcome, we can take care of moving your patient records from your previous vet to our own.